Passage To Marseille is a heartfelt salute to the men and women of France fighting under the Free French banner against the Nazis during World War Two. The movie engages with a unique and courageous flashback within a flashback within a flashback technique to essentially recount four linked stories. The film's style and structure prevent any of the chapters from being totally absorbing, but there is enough going on with the dedicated cast to maintain momentum, both backwards and forwards. The main story is set at a camouflaged military air base in the English countryside, where Captain Freycinet (Claude Rains) oversees a Free French bomber squadron flying night missions to hit German targets. Jean Matrac (Humphrey Bogart) is a machine gunners on one of the bombers, and on the return flights he drops steel tubes containing messages to his wife and son, who live under occupation in the French countryside. Freycinet recounts Matrac's story to a visiting journalist. In the first flashback, Freycinet is sailing on-board the Ville de Nancy, a small French merchant boat heading from Central America to Marseille, with the war just having started. 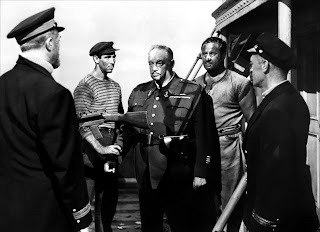 Also on board is pompous French veteran Major Duval (Sydney Greenstreet), who wrongly believes that the Maginot line will stop any German attack on France. On the journey, the Ville de Nancy picks up five men spotted drifting on a ramshackle raft, including Matrac, Marius (Peter Lorre) and Petit (George Tobias). They rescued men initially claim to be miners from Venezuela, but Duval suspects that they are convicts, and he is right. In a story told through the second flashback, the five men eventually admit to Freycinet that they are escapees from the notorious French Guiana penal colony. Despite being convicted prisoners deported for life, they wish to return home and fight for France against the Germans, and are helped by a patriotic old timer to plan and execute their escape from the unforgiving jungle colony. As the escape from French Guiana is unfolding, the third flashback reveals Matrac's pre-war background: he was an anti-establishment journalist writing for a small newspaper, highly critical of French politicians trying to appease Hitler. With the authorities wanting him silenced, he is framed and convicted of a murder that he did not commit. Before his capture, he marries his sweetheart Paula (Michele Morgan), the woman who now receives the messages he drops from the sky. 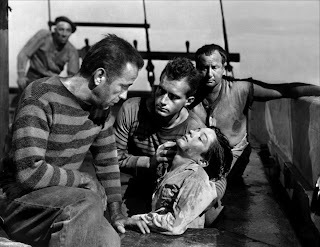 Passage To Marseille does suffer from an uncharacteristically disinterested Bogart performance, and the movie does not even try to explain his lack of an attempt at a French accent. 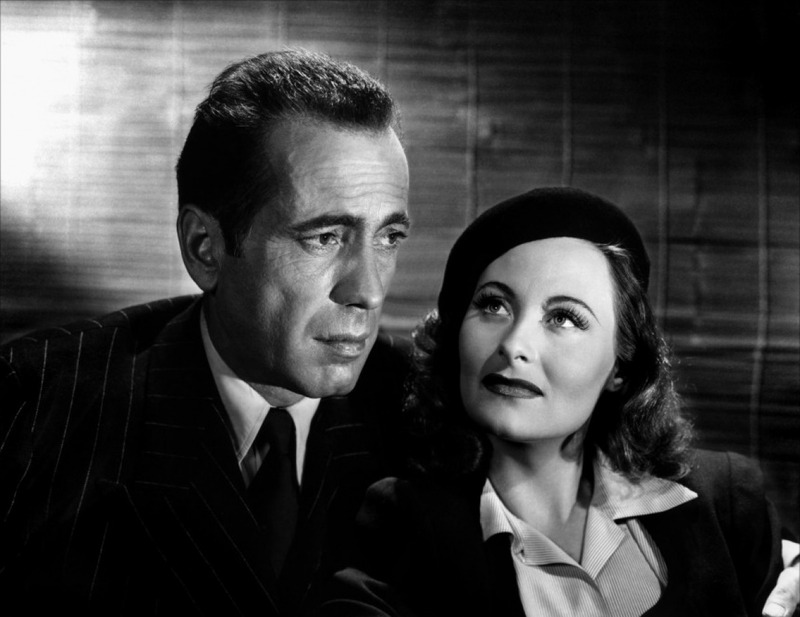 The romantic sub-plot between Matrac and Paula is sincere and well-intentioned, but is free of tension and occupies a limited amount of screen time, robbing Bogart of the relationship spark that he so effectively translates into rich drama in many of his best movies. But Passage To Marseille is an otherwise powerful World War Two film. Produced when France was still under the Nazi boot, the story is a reminder that many Frenchmen kept up the fight and did not give up on securing freedom for their country. While the internal French resistance network has often been celebrated, French soldiers who fought a more traditional war with the Allied armies have featured less frequently on film. The four stories are compact, and the transitions between them are handled seamlessly. Director Michael Curtiz keeps the time shifts linear, moving one step at a time sequentially backwards and then again forwards, the rational progression between timelines effective in maintaining coherence. The segment on the Ville de Nancy emerges as the core of the movie, bringing together all sides of France. While Matrac and his fellow escapees are risking everything to take the fight to the Germans, Major Duval represents both the clueless officers underestimating the enemy and then the surrenderists all too quick to align themselves with the puppet Vichy government. When shooting erupts on the boat and a German fighter plane attacks, Matrac shows no mercy, in a scene deleted from some earlier versions of the film for its rather astonishing but honest brutality. The reconvening of Curtiz, Bogart, Rains, Lorre and Greenstreet, as well as the use of flashbacks, forces a mention of Casablanca, but Passage To Marseille is a different kind of film, grittier, less romantic, and more concerned with the mechanics of war and the motivations of the men who decide to fight. Rather than the beginning of a beautiful friendship, Passage To Marseille is about the fierce patriotism most needed in the days of darkest oppression.